My husband and I knew upon moving into our home that we had plenty of space for storage. There’s a decent sized closet under the stairs, and we knew that if it didn’t have a purpose, it would quickly start collecting junk…so we decided to utilize it for our kids. They refer to it as their “clubhouse,” but I like to think of it as a great place where they can make a mess with art projects, sit and read books or just hang out and play. Because space is limited, I decided on a small, wall-mounted table that could fold down when not in use. Above the table, I created a fun gallery wall that includes a shelf and a place to store crayons. It also features a galvanized metal organizer for the boys to stash loose papers and projects. In the back corner of the closet area, I created a reading nook with a wooden pallet topped with a dog bed for a cushion, and I finished it off with some bright and colorful pillows. Wall-mounted spice racks are great to use as book shelves. This is the perfect little spot to curl up and read some books! 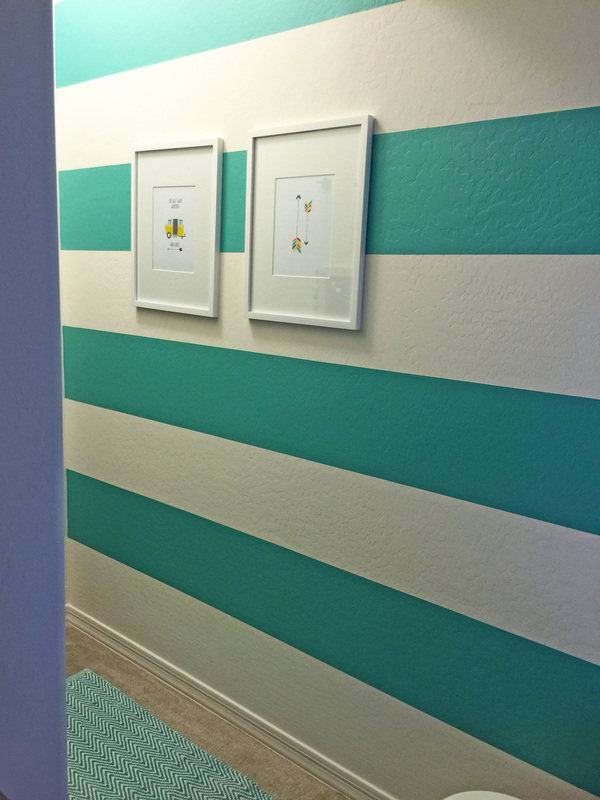 I painted horizontal stripes on the longest wall in the closet to bring in some additional color and pattern. I wanted the space to function for all three of my boys, and adding the chalkboard wall was a really important element for my toddler. There’s a wire with clips above the chalkboard where the boys can proudly display their artwork. I also added a metal mailbox at the entry to encourage imaginative play. My kiddos are absolutely smitten with the way the space turned out, and I have a feeling when they’re not using it, you may just find me in there for a little quiet time too! Thanks for taking a peek into my closet turned kids art studio and reading nook! Do you have a space that you’ve transformed for your kids? I’d love to see it! Upload your photos to our Project Gallery. Where did you get the dog bed and chalkboard? Adorable! Hi Nicole! The Dog bed cushion is from Homegoods and the chalkboard was a DIY project. I painted the the wall with chalk paint and then framed it out with a ledge from IKEA and 1″ x 2″ trim. I love absolutely everything about this!!!! Ugh- I meant * there!!! This is adorable, Rebecca! What paint color did you use for your stripes? love It. Love this! Could you share the paint color you used for the stripes? I think this would be perfect for my game room! Thanks!